Last Saturday I had the opportunity to play a private course I’ve never visited before, Brackett’s Crossing Country Club in Lakeville. Mr. Miller hosted our foursome (thanks Brad!) and we had wonderful fall weather to play what was likely my last round of the year. 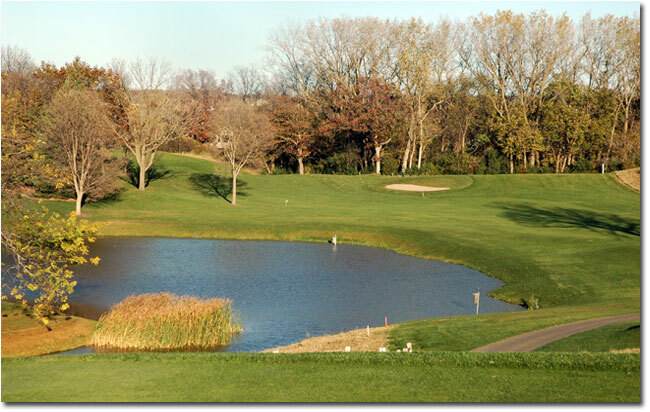 The 6,990-yard, par-71 course was designed by Don Herfort and opened in 1961. We felt the back nine was much stronger than the front nine, but overall the conditioning was great and I enjoyed the round. The greens were very quick, which created all sorts of fun putting situations. My favorite hole was the 408-yard, par-four fifteenth, which involves a tee shot from an elevated tee across a pond to a dogleg landing area (pictured above). The pro shop seemed very nice, but I didn’t really get to spend much time in the clubhouse. I think they were hosting a high school dance and the fried food being prepared made the walk up the 18th fairway feel like the state fair. I’m not sure how many members BCCC has, but lots of them were out Saturday enjoying the rare treat that is mid-October golf in Minnesota. In the beginning, finding the right pair of shoes makes all the difference in the world – if they don’t feel right, you won’t like it and will likely get hurt. If you get blisters or feel any extraordinary pain, keep trying different pairs until you find the one that feels the best. If your fitting was at a true running store, your chances are much better, but even they don’t get it right all the time. The better stores will let you exchange lightly used pairs until you are happy. As for running plans, it really depends on what you want to get out of it. I ran track and cross country in high school, then didn’t do anything in college. I can’t remember why, but I set a goal to run a marathon in 1995 and finished Twin Cities that year by roughly following Jeff Galloway’s original book (he has a bunch out now). I swore I’d never do another one, but I was never in shape when I wasn’t running. Two years later I decided to run Grandma’s in Duluth and I’ve been hooked ever since. Racing at all levels is a total rush – especially the ones with a lot of people. 5Ks, 10Ks, halfs and full marathons are all really fun and give you an incentive to keep up with training runs. No need to stress about missing days – just set aside time for runs whenever it works best for you. I’ve run early in the morning and late at night – nothing wrong with either, just stay safe. For a long time, I hated training runs, but loved races. Two years ago, I started running with a neighbor, which made it much easier to get out there, since I knew someone was waiting for me. She started out with the Grand Old Day 8K race as a goal, then moved on to a half and ended up running Twin Cities with me last year. Another high school friend set a goal to run a half last year also, which we did together in Stillwater. You don’t need to go all out, but I would recommend picking a 5K or 10K race a few months out as a goal, then start slowly. There are a ton of running plans out there, but I usually find them a little too rigid. I like to try to get in 2-3 shorter runs a week and one longer run on the weekend. I’ve also thrown in some cross-training the past few years that has helped a lot too (especially mountain biking and weights). I don’t do much in the way of speed work or intervals, but do try to run hilly routes on occasion. Be sure to stay hydrated when it’s hot and when you go on longer runs. I don’t do much in the way of stretching before or after runs (usually do a cool-down walk at the end, though). Runnersworld.com has a free online training log that I use to keep track of mileage – don’t have to do this, but I like to know how far I’ve gone. iPods? Sometimes yes, most times, no (personal preference). I usually run with a watch to keep pace, but not really needed when you are starting out. As for age, I’ve gotten faster and faster the older I get. My fastest marathon time this year was almost an hour better than that first one 15 years ago. I regularly get passed by older runners in most of my races and I’m always amazed at the times I see posted by seniors. Starting out can be frustrating, as the first few weeks are always the toughest. Once you get past that, though, you will feel better and benefit from all the perks of becoming more physically fit. “Runner’s high” really does exist and is a beautiful thing. 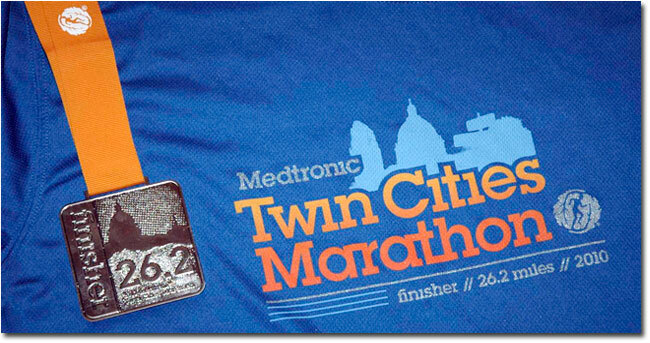 Yesterday was the 29th running of the Twin Cities Marathon (and my seventh TCM). My brother Brian came up from Florida to run it for the first time and we were joined by Lisa, one of his Disney co-workers. This was also her first TCM, so it was fun running with two first-timers (although both had run marathons before, including several Disney races). The weather was perfect – 37 and sunny at the start with little wind. The forecasted high was 62, but I’m not sure if it got that warm. I wore shorts and a long-sleeve shirt and was never hot or cold. I also wore gloves at the start and handed them off to the family just before the half-way point. Brian and I hadn’t trained much for this race. His excuse was warm weather in Orlando this fall and mine was the new job up north (and all the commuting). I’ve only run a total of about 60 miles since Grandma’s in June, so I was planning on a nice, easy pace this time. Lisa and Brian both subscribe to Galloway’s run/walk method, so I thought I’d try it out with them. They were doing the 4-1 version: four minutes of running, followed by one minute of walking. Lisa’s watch was set to give audible indicators, so you didn’t really have to keep track. They were a little more consistent than my usual splits, but they all needed to be closer to 10:00 to meet Brian and Lisa’s original goal of 4:30. Lisa started to get leg cramps after we crossed the river, so those later splits included more walk breaks than usual for the 4-1 method. She really wanted a PR, though, so I helped coach her down Summit and she ended up getting it by a minute and a half. After the race, Brian was selected by TCM staff for a “middle of the pack” award. He got a cool gift bag with about $300 worth of stuff (gift cards, poster, hat, magnets, DVD, book). Two neighbors earned Boston qualifying times – congrats Heidi and Michelle! I was hoping to join them next April, but my lack of focus on proper training have postponed those plans. I’ll probably run Grandma’s and TCM next year, since they are anniversary years (35th and 30th, respectively). New York City will depend on the lottery draw and I may throw in a smaller race depending on how much I get to run in the coming months.